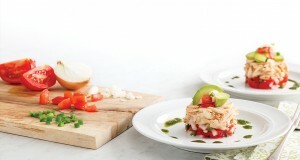 This tempting Crab Napoleon takes sweet, tender Louisiana crabmeat (it’s worth the splurge to get jumbo lump) and dresses it simply with citrus juices, fresh pico de gallo, and a drizzle of luscious cilantro oil. It’s a stunning start to any early summer gathering. 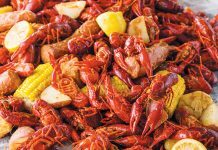 In a medium bowl, combine crabmeat, shallot, lime juice, salt, and chili powder, tossing gently to coat. Cover and refrigerate for 1 hour. Slice avocado, and place in a small bowl. Gently toss with lemon juice to prevent browning. Place a 2½-inch ring mold on a serving plate. * Using a slotted spoon, place 3 tablespoons Pico de Gallo in mold. Top with ¼ cup crabmeat mixture. While lightly pressing on crabmeat mixture, carefully remove mold. Top with 2 slices avocado and 1 teaspoon Pico de Gallo. 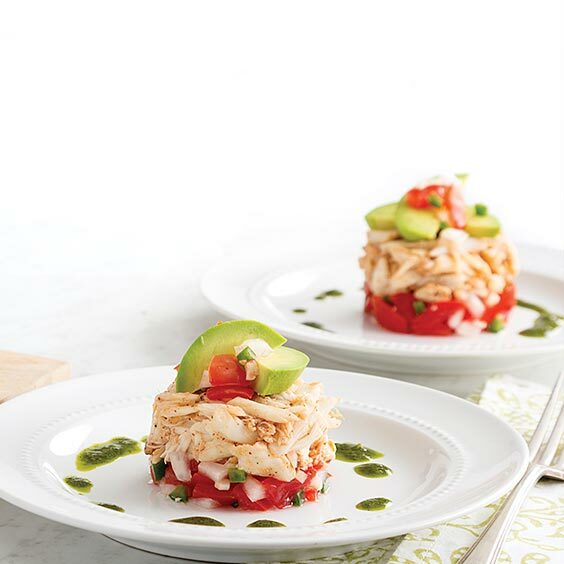 Drizzle Cilantro Oil around Crab Napoleon. Repeat procedure 3 times with remaining Pico de Gallo, crabmeat mixture, avocado, and Cilantro Oil. Serve immediately. *A 4-ounce can from diced or chopped green chiles (with the top and bottom removed) can be used as a mold. 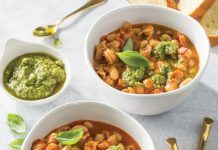 In a small bowl, combine all ingredients. Cover and refrigerate until ready to use. In the container of a blender, place cilantro, 2 tablespoons oil, vinegar, garlic, salt, and cumin. Cover and pulse until cilantro is chopped, stopping to scrape sides of container as needed. With blender running, add remaining 2 tablespoons oil in a slow, steady stream. Blend until smooth, 2 to 3 minutes. Refrigerate until ready to use. Whisk before using. I don’t know why you insest on bastardizing everything with cilantro? 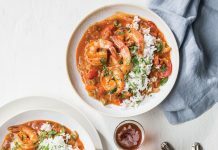 I never heard of it in a traditional Cajun or Creole cookbook! Why don’t we add some Hershey’s chocolate syrup? Wouldn’t be authentic either, but it would make it taste better not worse! A well deserving appetizer and a good conversation piece at the dining table.